His interpretation is the final impression. ERINDALE’s Patrick Young does not go for the big giggle in this surprisingly empathetic insight into one of Shakespeare’s most enigmatic characters. Young and his role players are confronted with relentless challenges both in staging and in performing this unwieldy assembly of plots and agenda. Intrinsically confusing, the sub-plots and machinations are worthy of an 800-page Russian novel, yet serendipitously, everyone meets up with everyone else at just the right time. Young has taken stage simplicity to a new level. Props – cushions; a chair and a sheer curtain. A clever projected backdrop by Lumir Hladik depict pre-Common Era frescos, the sea, Bokhara rug patterns and ancient tiling. Thus, distraction from the melodramatic histrionics that the cast members must narrate becomes negligible. Unsurprisingly, the title role is the most testing. Monologues and dialogues are rampant yet underscoring their impetus is mandatory. As Pericles, Brett Houghton`s almost angelic face belies such a character as is the real charismatic Greek soldier-politician-orator historically categorized. Yet Houghton manages to imbue his reading of the role with empathy and what one must assume is his own understanding. Being able to faultlessly recite a trillion words of discourse boggles the mind. Although there are numerous multi-role depictions, there are some outstanding support characterizations. As Antiochus, Spencer Bennet oozes menace. He`s both physically and theatrically intimidating. The ingenuousness displayed by Marissa Otto seems almost intrinsic and biological. The Cleon (Governor of Tarsus) version by Shawn Doyle brings an insisting urge to want to analyze the man`s personal schema even deeper than did the playwright(s). There is a comedic rendering & it`s Hershel Blatt`s take on King Simonides. He seems to thoroughly enjoy his crown and adulation. The influences proffered by Pericles’s advisor – Helicanus, are not only credible but sincere. Shaquille Pottinger’s makeup demonstrate what a handsome (older) man he`s destined to be. A standout contribution in about eight roles is all of those played by Emily Thorne. Her animated face, ebullience and dynamically physical expressiveness reflect that certain something that separates one from the crowd. Miss Thorne; upon graduating never miss auditioning for Princess Winnifred; Lili; or Holly Golightly – you`d be a natural! The play is longish and definitely requires audience attention, but is an epitomic example of what pure theatre can accomplish with dynamic direction; highly focused and motivated actors, plus a milieu that reeks of what the genre is all about. 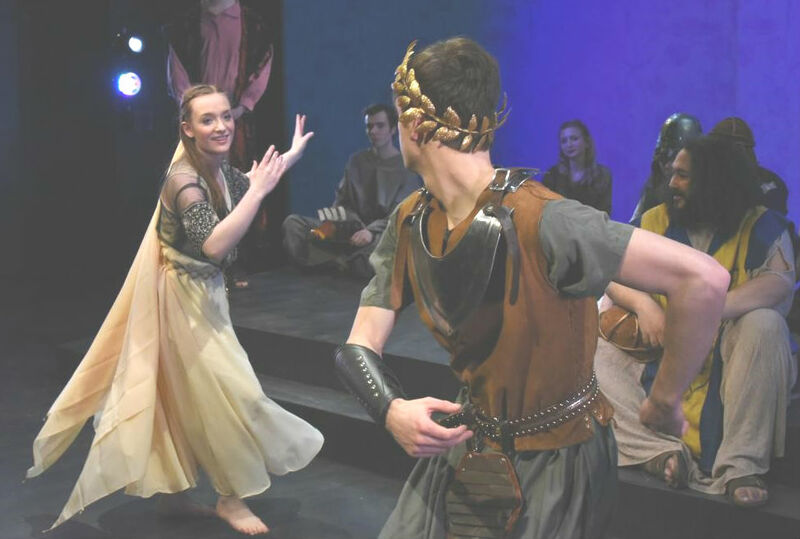 Last performance of PERICLES will be at Theatre Erindale (UTM Campus) on Sunday, Feb. 28th. RUN; Don`t walk, to see it!